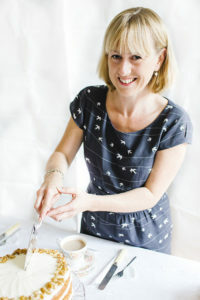 I grew up in Cornwall and learnt to bake from an early age, spending time in the kitchen with my mum and grandmother. Although I left Cornwall a long time ago I still think that most cake tastes better with a generous dollop of clotted cream! After graduating from SOAS I settled in London, and worked as a PA for several years. I now live with my husband and two children, and bake cakes most of the day and half of the night. I also love developing new recipes, and have been commissioned to write for the Good Food web site. I plan to share my recipes here, on my web site, as well as news and pictures of my latest creations.